How Many Calories Should I Consume While Breastfeeding? A stuffy nose is a common pregnancy ailment. According to BabyCenter.com, it affects almost one-third of all pregnant women. Doctors refer to this harmless condition as “rhinitis of pregnancy.” Women can take several measures to help relieve symptoms, while patiently counting the days from early pregnancy until a few weeks after delivery when this condition usually resolves itself. Elevated levels of estrogen and other pregnancy hormones can cause a woman’s mucus membranes to swell inside the nose, according to GYNOB.com. This can lead to a stuffy nose in addition to nasal irritation, sneezing, coughing and sometimes even headaches. In addition, increased blood volume during pregnancy can cause everything to swell, including the membranes of the nose. Other common issues can also lead to a stuffy nose during early pregnancy. Many women find their allergies exacerbated during pregnancy, which means increased sensitivity to new and old irritants and allergens alike. These can lead to a stuffy nose, as can a common cold or other respiratory infection. Most women begin experiencing a stuffy nose as early as the second trimester, and congestion can occur anytime until even a few weeks after delivery. Pregnancy rhinitis can last for as long as six weeks anytime during this timeframe, according to the Women’s Healthcare Topics website. Without any other symptoms, a stuffy nose is usually an indication of rhinitis of pregnancy. When a stuffy nose comes together with sneezing, coughing, sore throat and body aches, it is likely a cold or respiratory infection according to BabyCenter. 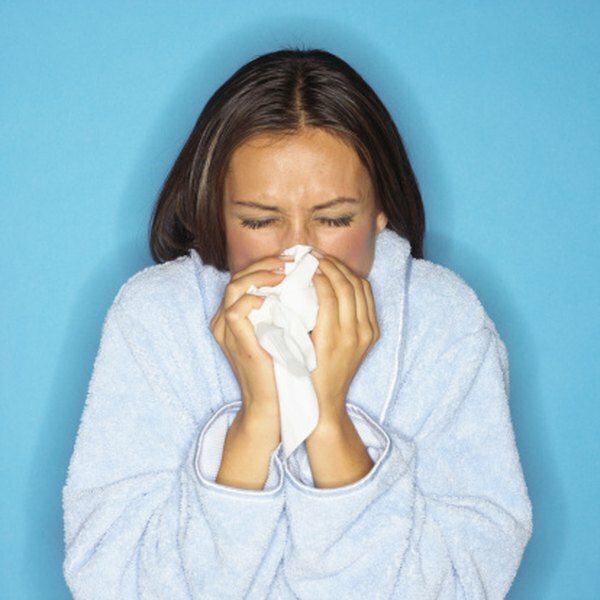 A stuffy nose accompanied by sneezing and itchiness in the eyes, ears, nose and throat is usually a sign of allergies. To make the discomfort even worse, it is common for pregnant women to suffer from a combination of allergies and rhinitis of pregnancy. There are several minor adjustments pregnant women can make to help relieve stuffy nose discomfort. Drinking plenty of water and non-caffeinated beverages can help, as can sleeping with the head propped up by an extra pillow or two. Steam showers or a hot washcloth held to the face can provide temporary relief, as can using a humidifier or vaporizer to add moisture to the air. Pregnant women can also utilize over-the-counter nasal saline sprays or drops to moisten nasal passages. Pregnant women should avoid sudden temperature changes, cigarette smoke and prolonged time spent outdoors on days when air pollution is high, as BabyCenter.com notes that these can exacerbate a stuffy nose. If home remedies do not provide sufficient relief, consult a health care practitioner to discuss medication alternatives. There are several nasal decongestants or allergy medications considered safe for use during pregnancy with medical approval.